David Walter was the son of Walter Walter and Ann Leach Penny (see Walter Family of Babcary). 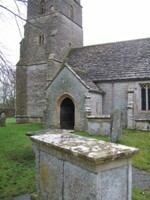 Aged 18, he is listed in the 1861 census at Greenhill Farm, Foddington, Babcary, Somerset. In 1871 he was working as a general servant in the household of William John, clerk to the commissioner of taxes, at Bryn Teg House, Llantrisant, Glamorgan, South Wales. David married Catherine Rosser (note this is often transcribed as Roper), born Llansannor, Glamorgan (1846-1880) at the church of St Hilary, in the Vale of Glamorgan on 11th July 1877. Catherine was the daughter of David Rosser (1819-1906) and Ann Hopkin (1817-1890) (married Llansannor, 5 March 1841) who also had a son Thomas Rosser (1842- ) and two other daughters - Mary Rosser (1849- ) and Sarah Rosser (1850-1926), all born Llansannor and another daughter Ann Rosser (c.1857- ) born in Llanblethian. (See The Family of Thomas Rosser). Sarah Rosser emigrated to the USA in 1872 and married George Frederick Atkinson (1845-1940) in San Francisco, California. Catherine had been a domestic servant for the Baillie and Traherne familes in the area. David and Catherine had two sons: Albert Edward Walter (1878-1943; registered as Albert Walter Walter, Cardiff Registration District and baptised in Peterston Super Ely (near Cardiff) and David Thomas Walter born in Peterston Super Ely October quarter 1879 and baptised March 7 1880. Catherine died at Allt Ucha, Peterston Super Ely on 11th December 1880 having suffered from Phthisis (pulmonary tuberculosis) for two years. Cardiff Times November 11 1882 - COWBRIDGE PETTY SESSIONS (...) David Walters, late of St. Hilary, gardener, and Jacob Davies, tailor, Llanharran, were charged by Mr John, relieving officer, the former with neglecting to maintain his child, and the latter with neglecting to maintain his wife and children. An order was made in each case. In 1891 the children were living with two of David's sisters. Albert was with Susanna and her husband George Philip Hayes (1858-1920; born Ashcott, Somerset, died New Forest) a draper and clothier whom she married in 1886. David Thomas (listed as Fred) was with Caroline and her husband William Whittle (1837-1903) born in Barton St. David, Somerset whom she married in 1885. They were living in Babcary next to the schoolmaster and William was described as a farmer. In 1891 David was employed as a gardener at Waunarlwydd House, Waunarlwydd near Pontardulais, Swansea, the home of John Powell, J.P. (c.1835-1910) and his wife Ann Powell. 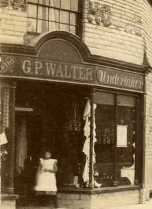 In 1901 he is named as Daniel Walter at 27 Brunswick St., Swansea - ironically, near Walters Road. He was a boarder in the house of Rosa Jeffree (the widow of Thomas Jeffree who had died in June 1900) and employed as a domestic coachman - equivalent to a modern chauffeur but with responsibility for the horses and the coach itself - perhaps for John Powell as it was within easy walking distance to his then home in Brynmill Crescent, Swansea. The age is correct at 58, he is listed as a widower, born Babcary (there is no Daniel meeting these criteria). Albert's marriage certificate gives David's profession as 'Jobmaster' - a person who let out horses and carriages. 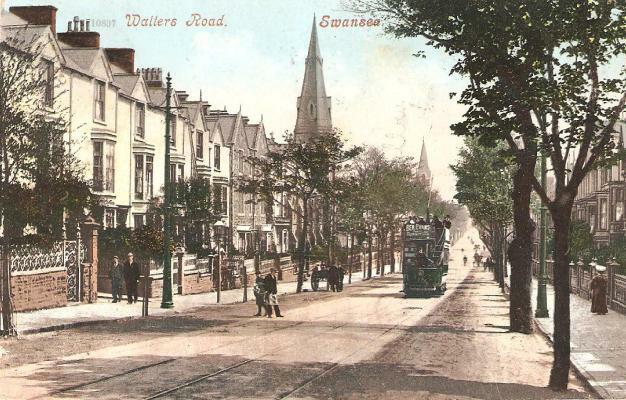 David Walter, a domestic coachman of 50 St Helens Avenue, died of Uraemia and Bright's disease in Swansea Hospital, August 1903 aged 60 in the presence of his sister Susanna Hayes. Albert Hugh Walter (1906-1975; born Penge). Albert Hugh Walter married Lois Helen Bothwell (1912-1992, born Ottawa, Ontario) and died in Vancouver, British Columbia. He lived at 1966 East 19th Ave. Vancouver and was a photographic supplies salesman. He was buried at Mountain View Cemetery, Vancouver, reference WALTER, Albert Hugh (buried) Jun-04-1975 (location)	ABRAY/*/03/*/1750 together with his wife Lois Helen (buried) Oct-30-1992. (Lois had died on June 19 1992 and was cremated so, presumably, the burial was of her ashes). Doris Frances Walter (1909-1912, born in Lewisham). Cyril David George Walter (1910-1941; born Brentford). Cyril served in the RAF 207 Squadron Volunteer Reserve and was killed in action over Belgium. Eileen Mary Walter (1915-1992; born Richmond) married Timothy Larkin in 1941. In 1911 Albert Edward Walter was living at 72 Silver Crescent, Gunnersbury a few doors away from Albert's first cousin, Edward Ernest Walter (1878-1938) and Albert was working as a draper's assistant (buyer). Edward Ernest married Elizabeth Horne (1876-1952) in 1905 and had two sons: Edward Henry Walter (1909-1982) and Kenneth Gillett Walter (1911-1996). Edward Ernest joined the Royal Flying Corps in the First World War, his medals indicating that he served abroad (Ref: 111339). After the war he returned to the drapery trade in London.